CES is one of the most competitive tradeshows in the world. You can feel the intensity the second you walk onto the showroom floor. And you can see it and hear it. CES is filled with stunning visuals and some of the most captivating displays ever assembled. It becomes really obvious really quickly that ordinary A/V simply won’t cut it. Without exceptional, or even over-the-top visuals, it won’t matter how innovative your product, it runs the risk of getting lost in the explosively high-energy world that is CES. The experts at 2020 Exhibits have you covered with our extensive offerings in A/V rentals. 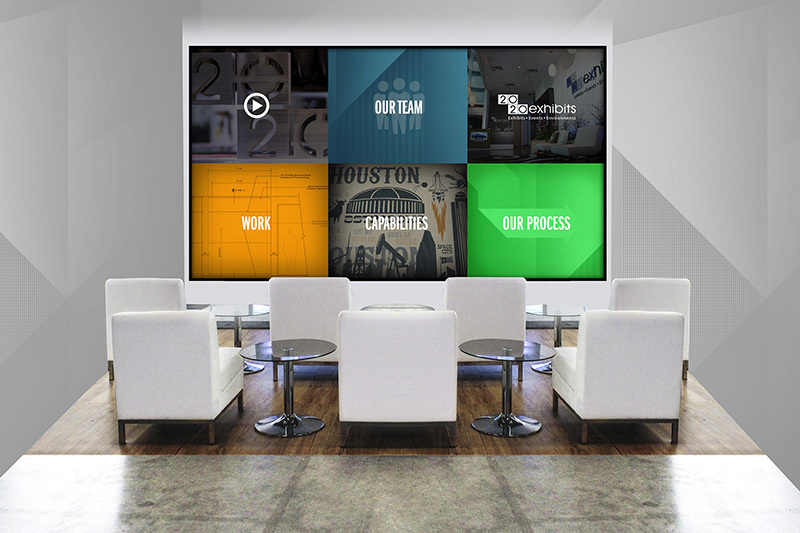 With an endless array of A/V options, 2020 Exhibits can provide the technology you need to rise above the clutter, giving your exhibit the “wow-factor” you’ll need to compete and draw visitors to your space. Drive powerful, engaging face-to-face experiences through 2020 Exhibits turn-key A/V services, technologies and interactive audio visual and digital media including enormous video walls, vibrant 90″ monitors, sleek touch screen kiosks, 3D animation services, multimedia presentation design, sound systems, video processors, interactive tables, After Effects, iPad apps, and multi-screen environments. We can handle it all – from strategy and creative content creation to logistics and installation.